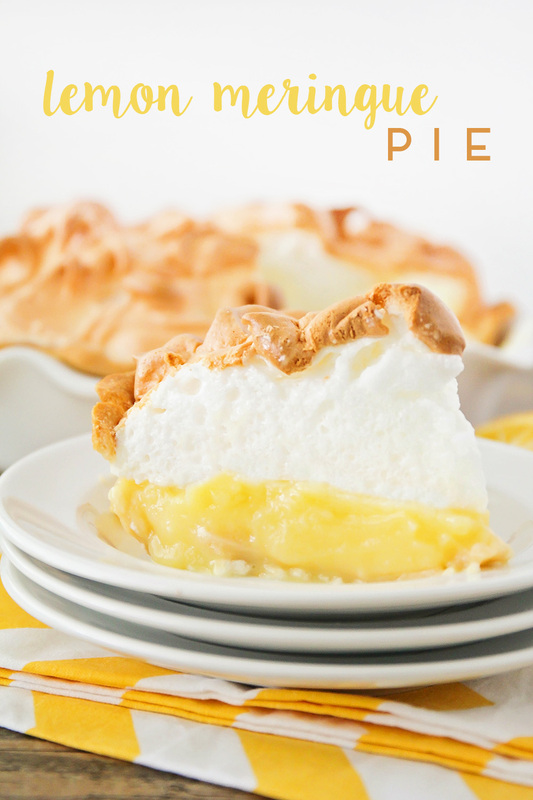 This lemon meringue pie is so heavenly and easy to make too! 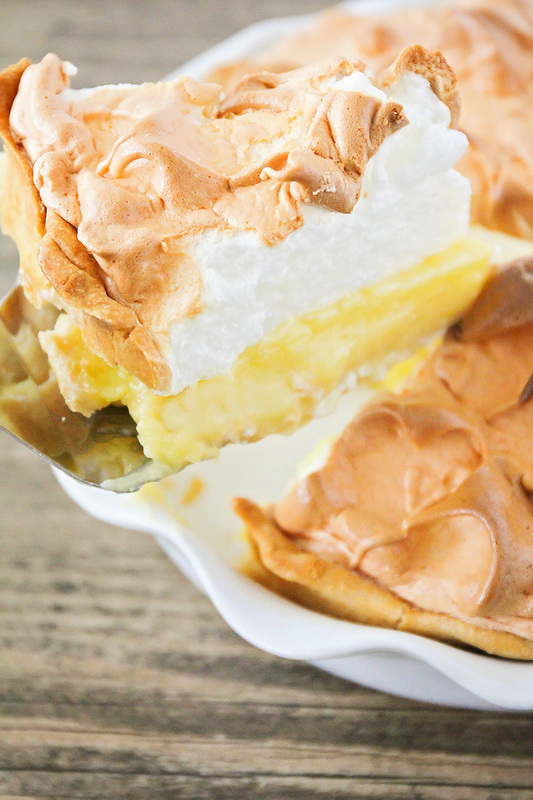 Deliciously tart and flavorful lemon custard topped with clouds of sweet fluffy meringue, for a show-stopping dessert! Does anyone else celebrate Pie Day? I mean, how can you not? Pie is one of the most delicious foods ever created, so it only makes sense to devote a day to admiring its amazingness. My husband and I have an extra reason to celebrate, since it's our wedding anniversary! I'll admit that in the past, we haven't done such a great job with our anniversary. We rarely buy each other gifts, and there have been years (like last year... I think?) that we have forgotten our anniversary altogether. It's not that we don't love each other, or don't absolutely love being married. We just tend to celebrate the anniversary of our first date and forget the anniversary of our wedding. Well this year, I decided that from now on, we are just going to celebrate with an anniversary pie. Simple, easy, and (hopefully) memorable! 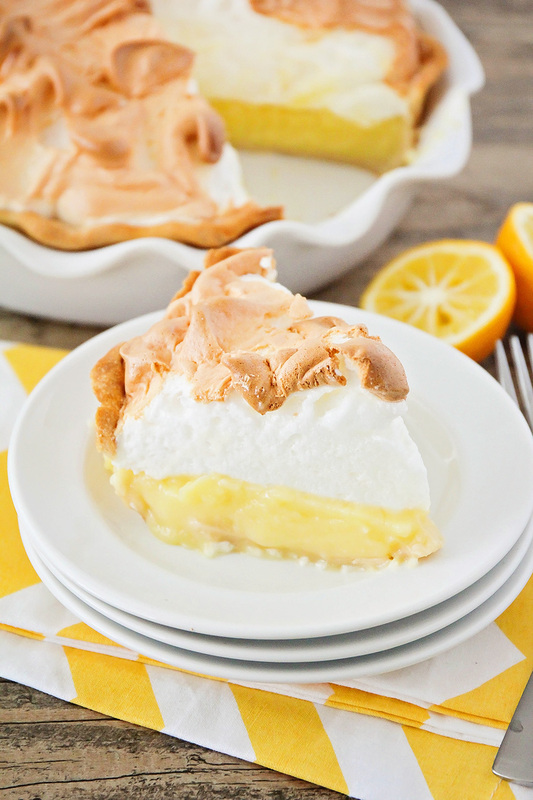 This lemon meringue pie is a great choice for celebrating pie day. 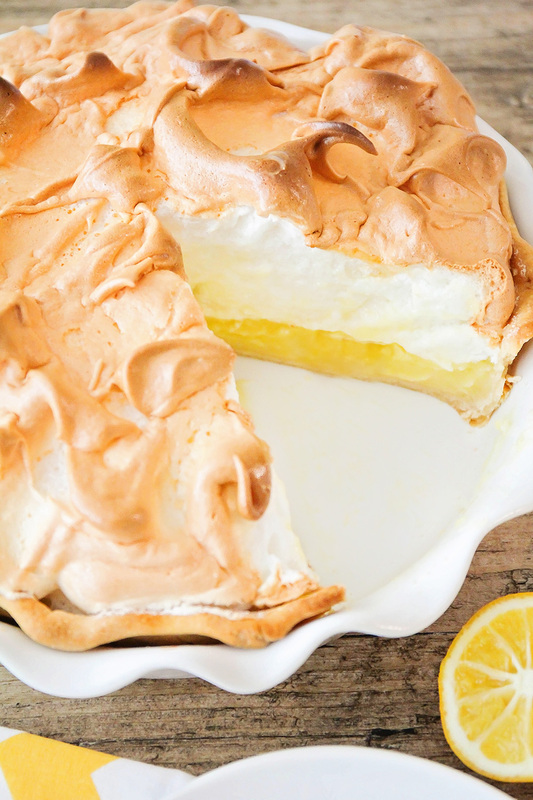 It's perfectly tart and lemony, and topped with an amazingly light and fluffy meringue. I tend to be a little scared of baking pies, having had many a pie fail in the past, but this pie was super simple to make and came out perfectly! I still wasn't brave enough to try a homemade crust (baby steps), but I was pretty happy to have such a fantastic result for my homemade pie filling and meringue! In a medium saucepan, whisk together the sugar, cornstarch, and salt. Add the egg yolks, milk, lemon juice, and lemon zest, and mix to combine. Bring the mixture to a boil over medium heat, stirring frequently. Boil for one minute. Remove from heat and stir in butter and vanilla. Pour into pie crust and spread evenly. In a large bowl or the bowl of a stand mixer, beat the egg whites and cream of tartar until foamy. Add the sugar, 1 tablespoon at a time, while mixing constantly, until all the sugar has been added. Beat until the egg whites form stiff peaks. Add the vanilla and mix until combined. Spread the meringue over the lemon mixture. Bake 20-25 minutes, or until the meringue is browned. Remove from oven and cool completely, then refrigerate until ready to serve. For more delicious pie recipes, check out these amazing posts from some of my talented blogging friends! I'm a sucker for everything lemon. This looks fantastic!! Oh, Alicia. That meringue! We love all things lemon so this looks pretty, pretty tempting!